Pickleball is the game that has caught the eye of more than a couple of dozen snowbirds that gather each Wednesday and Friday at the Destin Community Center for a friendly game. “It’s just taken off,” said Phil Holdsworth of Ontario, who is coordinator for the game. 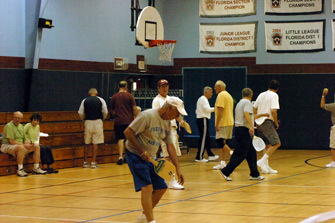 FULL COURT: The Destin Community Center has three courts open for Pickleball play and all were busy. ﻿﻿Holdsworth commended the crew at the Destin Community Center for providing the courts, nets and paddles and setting up the game. Pickleball is played at 10:30 a.m. until noon on Wednesday and Friday at the community center. For more information, call 654-5184. CLICK HERE for full article and more photos.